Sat November 10- “Trapeze Drop Out Shawl”- we will be repurposing the the malabrigo Silkpaca yarn into a new project. Needles needed are 32-40″ circ in in sizes 6 and 8. We have the Chaigoo in both sizes. 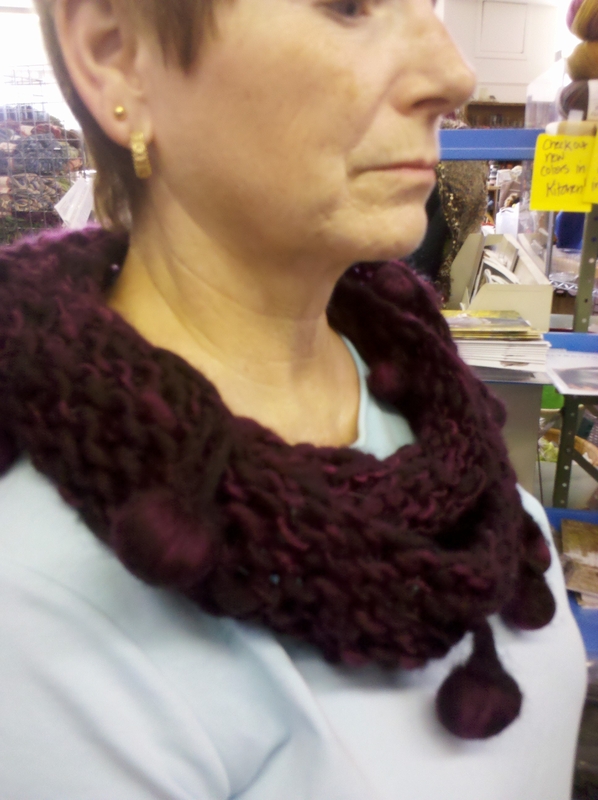 Here is Elaine’s Medusa Headband! Class is, Saturday Dec 1 at 10 am-12 to cost $10 plus materials (1 sk of Trabajo). 16″ size 6 and 8 needles. Speaking of camp!!! What a BLAST!!! We made Felt Ball Bracelets that turned out adorable!! Some even got the Hat finished also! Thanks to all who participated in a great weekend! Reminder- Dec 8- Handbags for Healing Trunk Show- We will have 20-30 bags!! Get here early! Remember we open at 10 am. Stitches was a Blast ! First, I want to thank all the great customers of ours up at Stitches Midwest!! The weekend is a lot of work, but you guys make it all worth while. If you have a group, or just you and you are coming to Indy, PLEASE stop by and say hello! And thanks again for a wonderful weekend! Second, Thanks to all the Mass. Ave. Bus riders. I have heard great responses. Heather and Elaine worked very hard to make it a fun time for you all! Stitches is earlier next year (aug 9th) so we will probably start taking reservations May 1st. I will keep you posted. Here are some pictures of the items that did really well for us at Stitches! Pagewood Farms Wool balls. I knit this cowl on a 17 needle one night in the hotel (in about an hour). 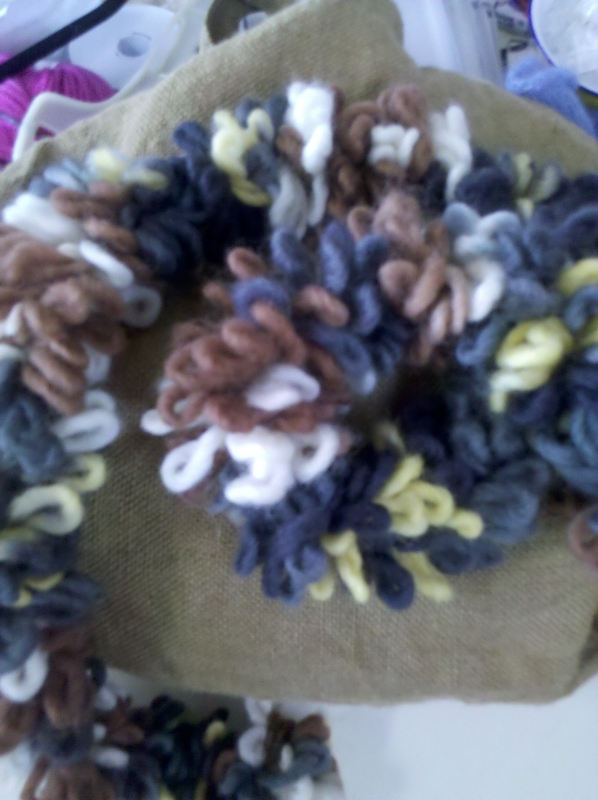 We have a couple colors left, but I am ordering more- This cowl has got to be seen- it is SO cute!! This Yarn(?) is finger crocheted. Beth started to wind the ball in the truck when we left the shop parking lot and had it finished by 38th st. We call it the 42 block scarf! Come in to see the colors we have left and for a demonstration. One skein makes a scarf. This is a great project for kids! Okay- this is my favorite. 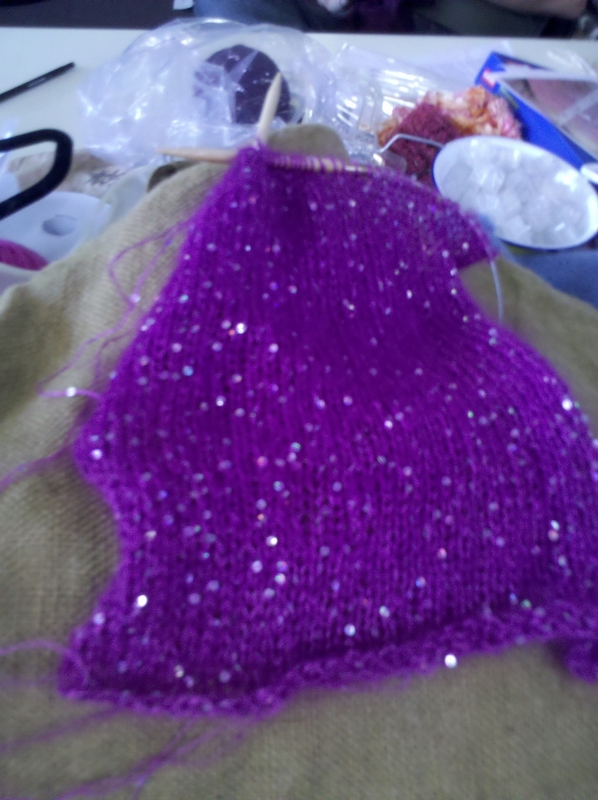 It is hard to tell, but it is a thread with sequins held together with lace mohair. If you bought this at stitches for the scarf-I have revised the pattern! I have changed to a size 10.5 needle and cast on only 40 sts. I like this better because it is more open. I think 1 ball of each yarn will do it. Keep posted and I will show the finished product in a few days. I will also show you the colors options (they are still in a box somewhere). The color selection is amazing! The 2nd annual Indian Summer Pitch-In is just around the corner! Sat. Sept 17 at 5:30 the fun will begin! We will have door prizes and some special deals just for you! Last year we had around 40 people, so cook accordingly. We will provide Brats, Hamburgers, and Hotdogs. Bring your own drink. We will have ice. This thurs Sept 1 is Open knitting from 5-8 pm. Bring what ever you want to work on. All are welcome and there is no charge! Don’t forget that Sept 8th is Superbowl Scarf Knit night. The time is getting closer every day to the nov deadline to turn in your scarves. Sarah Burton will again join us with some of her fabulous patterns. If you missed her last time,DO NOT miss her this time. It will be well worth your time!! Okay, so the NFL guys have gotten things straighted out! Now we ( and I include myself in this group) need to get those Super Scarves that we have started out of our knitting bags and finish them and turn them in. We will have at least 2 more Super Scarf Knit Nights. The first will be Thurs Sept. 8 from 5-8 pm (the 2nd- tba). There is no fee for this. It is just a night to come and work on your scarves. The other good news is that the 2nd bus to Stitches is a go!! The Bus trip is Sat. Aug. 27, 2011. We still have some seats, so if you know anyone who has not signed up yet, tell them to get their checks for $60. in to the shop. We also need e-mails and cell phone numbers. We will be making a stop in Lafayette, if that is more convenient just let us know. The bus leaves Keystone at the crossing at 7:00 am and returns around 10 pm. Call the shop if you have any questions. Tomorrow night (Tues) is the last Classic Elite Knit Night. We will have the drawing for the $100 gift basket on Sat the 30th. I need to see your finished project before then. We will meet Sat at 1pm to show off our items and have the drawing. Don’t forget!! Jane is back safe and sound from her cruise to Bermuda! Our next cruise will be to Alaska in 2013, so start saving your change. We will hopefully have more info in the near future. The cruise we did in March was amazing, and I think that Alaska will also be fantastic! Next overnighter is Sat. Aug 13. It starts at 7:30 pm and goes to whenever! Cost is $20. plus a small snack to share. If you think your snack is great, bring in a copy of the recipe. We are thinking of putting together a mass. ave. overnighter cookbook! I will take care of the pizza and drinks for the night so don’t eat dinner before you come!! No need to sign up, just show up! Don’t forget that Mass. Ave. Knit Shop will be closed the week of Aug 22-28 for Stitches. We will reopen on the 29th.